“I am an en route air traffic controller and shift manager at Brisbane Centre. ADS-B gives me a very accurate position of where an aircraft is, in three-dimensions, rather than just using information taken from a pilot’s position report. ADS-B gives us a huge advantage with sequencing aircraft closer together. If we are running a tight separation standard between aircraft we can accurately see their ground speeds. If they both want the same flight level, we can change their speeds so they meet the required five nautical mile minimum standard. However, if we were controlling them procedurally without the use of ADS-B, then we would have to apply a separation distance of up to 30 nautical miles or a time standard of up to 10 minutes, which is not very efficient at all. If we have a weather diversion request from a pilot, with ADS-B we are able to see exactly where they are and can accommodate the request a lot easier. This is certainly a safety benefit, but it is also an efficiency gain for the operators because they’re more likely to get an efficient flight level which can reduce their fuel burn or give them a larger tailwind. With ADS-B, we can accommodate more aircraft in the same airspace, in a safer manner and with reduced radio transmissions…it has made aviation safer and more efficient. Another benefit of ADS-B is if a pilot experiences an emergency they can select a squawk code on their transponder rather than having to call up with a MAYDAY or PAN. We can start separating the aircraft from other traffic while beginning to alert the relevant search and rescue authorities. This leaves the pilot to flying the aircraft and handling the situation – they will talk to us when they can. 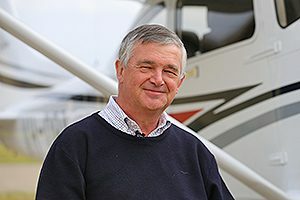 “I am an IFR general aviation pilot and the owner of a Cessna 182S. The principal reason for me to fit ADS-B in my aircraft was so I can be visible to air traffic control when I’m flying in areas not covered by radar. ADS-B was fitted into my aircraft in March 2012. It was a very easy decision to make for me because I had already decided on an avionics refit for the aircraft. The difference in cost of adding ADS-B capability, even at that time, was minimal. ADS-B makes general aviation aircraft visible to both air traffic control, and ADS-B IN equipped aircraft. This is a passive benefit but it is a very important one. In busy locations, instead of relying only on visual separation, or procedural methods between pilots or by air traffic control in instrument conditions, ADS-B serves as the enabling technology for surveillance based separation by ATC and alerting and awareness air to air. It therefore delivers safer and more efficient operations when mixing with faster aircraft. For an IFR pilot, and particularly people who have to travel significant distances, a number of really important advantages arise because the aircraft is visible to air traffic control. 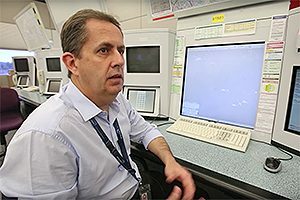 In particular, communication with air traffic control can be simplifed, and the workload between pilots and controllers can be significantly reduced. This is especially so when weather deviations are necessary, and in the more general case, because position reports are not required when identified under ASD-B. It can also be highly valuable as a tool for facilitating general aviation flights in and out of airports and airspace where traffic gets concentrated for short, but critical periods of the day. There are many locations and situations where ADS-B can ease the need for extended communications. A personal experience relates to a visit to Ayers Rock where I happened to arrive at the same time as an inbound Virgin Australia flight. My track, unusually, was from the north-west. I was actually flying VFR, but the controller was able to identify me a long way out from the airport and pass on my traffic information to the 737. With very little fuss at all we were able to establish what sequence was going to work best for the landings. As it turned out, I was able to join on a long 10 nautical mile final and landed safely well in front of the jet, without the need for extended manoeuvres or radio conversations during the busy, critical time, we were entering the aerodrome circuit area. In an emergency, if an aircraft is ADS-B identified it reduce the need for extended radio communications at a critical time for the pilot. Over the next few years, ADS-B IN will extend the benefits available to IFR aircraft today to all operations, especially VFR. The great advantage of ADS-B IN, compared to other traffic awareness technologies, is that the receiver and its display can be very simple by using an iPad. For example, arriving after dark at a busy capital city airport, such as Bankstown, often involves crossing unfriendly terrain, and dealing with airspace and clearances, even when still 30 nautical miles out. Being aware of other aircraft converging towards, or departing from the same direction as you, makes the arrival a lot less stressful if you know they are there. ADS-B IN provides a means to know where to look. “AAS Aviation is proud to support Wings4Kidz as both the air operator and maintenance provider. 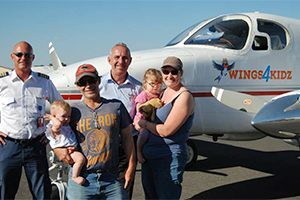 Wings4Kidz provides a free flight service for children in regional communities who have serious or life threatening illnesses and are required to travel to major city based hospitals for treatment. A number of AAS’s aircraft have been ADS-B equipped for several years, well ahead of the scheduled date limit. Why? Two words – safety and efficiency. Safety – ADS-B affords pilots confidence in knowing that air traffic control monitors aircraft separation across ALL of Australia, not just in a radar environment. Efficiency – the ease of identification afforded by ADS-B has resulted in AAS aircraft being granted clearances and direct tracking. The bottom line, ADS-B is a front line tool in the safe, smooth and secure carriage of sick kids across Australia. AAS Aviation and Wings4Kidz sends a big thank you to Airservices Australia. 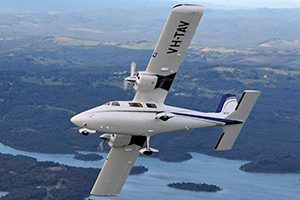 “I have owned and flown VH-TAV, an IFR Vulcanair P68C equipped with ADS-B IN/OUT since February 2016. Knowing that aircraft are becoming ADS-B equipped reduces the worry of having close encounters with other traffic operating very close to the IFR boundary. Since 2005, 95 per cent of my flying has been conducted under IFR. Before I had ADS-B, the controller would say ‘radar services terminated.’ Now, it’s reassuring to know that my aircraft is still visible to air traffic controllers on their screens at Melbourne Centre once I am outside of SSR (secondary surveillance radar) coverage. This is most useful when operating in remote airspace, subject of course to the level of ADS-B coverage. With ADS-B IN, seeing other aircraft on your screen you can make a more informed decision. With some avionics you can do this just by using an iPad. Even having ADS-B IN when flying near Moorabbin or Bankstown airports is a massive help in managing separation from other aircraft. Equally, ADS-B equipped aircraft are visible to each other without the need for an ADS-B ground station. Displayed information in the cockpit gives pilots enough data about traffic in the area to enhance their situational awareness. In terms of operating the flight and executing your navigational plan, to have the ability to detect and have other people detect you without the need for some third party to provide that support is such a benefit. If everyone had ADS-B it would be fantastic. But as an aircraft owner myself, I am aware of the cost to procure and fit compatible equipment in older aircraft, especially those that are not equipped with WAAS receivers. But the solution to this is now becoming more affordable. 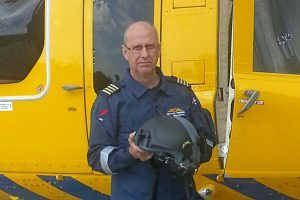 of emergency helicopter and aeromedical retrieval services for the Western Australian state government’s Department of Fire and Emergency Services (DFES). Along with our base in Bunbury, 200km south of Perth, we operate two Bell 412EPs which have both been upgraded with Garmin 750 avionics and have been incorporated with ADS-B and TCAS. We have been using ADS-B in our helicopters well before the Western Australia mandate came into being on 4 February 2016. ADS-B has proven to offer a significant increase in situational awareness for our pilots. Operating out of Jandakot Airport, certainly one of the busiest airports in Australia with a lot of small GA and training aircraft coming and going, we are able to identify where other aircraft are. This is where we have seen the biggest advantage. Instead of just getting an icon on the display, with ADS-B we get more information about the traffic on our TCAS. We get a much better picture of what is happening around us which is fantastic. ADS-B gives us greater situational awareness about what’s happening around us. When we do head out to the Wheat Belt area, usually flying at about 5,000ft, and we do go outside of radar coverage, in most cases we are then detected by ADS-B and the controller in Melbourne Centre can still positively identify us. This gives us piece of mind to know that air traffic control knows exactly where we are.